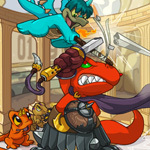 The Battledome has always been a very popular aspect of Neopets. It has also evolved over time: back in the old days, many weapons that are close to useless today such as the Dark Battle Duck were dominant. This article will go in-depth and explore some of the weapons and tactics that are to be used in modern intermediate one-player battling. First of all, there needs to be some discussion about intermediate battling. It is useful to break down weapons by cost. Newcomers to the Battledome can easily afford weapons such as the Scroll of Ultranova. Veteran battlers with deep pockets should can afford higher-end weapons such as the anagram swords from the Hidden Tower. The best battlers can afford extremely expensive weapons that most of us can only dream about, such as the coveted Skarl’s Sword. What about people who are in-between the extremes? People who have been battling for a bit, are willing to spend a little, but don’t have the millions needed to fund a high-end set? These people should look towards the weapons in this guide. There also needs to be a brief discussion about one-player battling. Currently, one-player opponents in the Battledome do not increase their hit points as players accumulate wins. This may or may not be fixed in the future. Furthermore, some tactics such as stealing do not currently work. However, the major tactics of one-player battling are still the same as they have always been. It is useful to freeze opponents and to heal your own pet. Cheap weapons that deal a lot of damage consistently are excellent. Furthermore, defense is considerably less important, especially if players do not choose to specialize in battling certain opponents. This weapon is the gold standard of intermediate battling. It is currently cheaper than 200k on the Trading Post and its price is falling fast. Turned Tooth deals about 15 icons constantly. Even though they are earth and physical icons, which are relatively easily blocked, the sheer volume of icons dealt overwhelms even powerful one-player opponents. Turned Tooth is easily the first weapon that should be bought out of all of these weapons. It has an insane damage-to-cost ratio, and makes it incredibly affordable to beat tougher opponents. This weapon is a recent release from Daily Dare and is also currently very affordable. It has a similar cost to the Turned Tooth. Although the Pistol deals fewer icons (13) than Turned Tooth, it also blocks an incredible five fire icons, meaning it is a dual-duty that deals about 18 icons total! Of course, more often than not, the five fire icons blocked are not useful. However, against certain opponents such as the Space Faerie, the fire icons blocked can be very useful. This is more of a secondary weapon to be used against certain opponents. Players should prioritize getting two Turned Tooth before even buying one of these. This weapon’s price has dropped considerably since Charity Corner, as more and more people are completing Jhudora’s quests and obtaining these. Jhudora’s Potion averages about 21 icons and inflicts heavy dark and physical icon damage. It can be used once per battle. This weapon is very useful for combining with Turned Tooth Lens Flare to quickly dispatch one-player opponents. It currently costs under one million Neopoints. Of course this weapon is not as necessary as the Turned Tooth, it is strong but can be used once per battle. It should only be obtained after players get their dual Turned Tooths. This weapon is a 100% freeze weapon that is very affordable on the Trading Post. It requires that the user be a Lenny- this is less of a problem because cheap Lenny Morphing Potions can be obtained on the Shop Wizard for less than 50,000 Neopoints. This weapon can be combined with Lens Flare to take an opponent out of the battle for two consecutive turns and is very useful for farming tougher opponents with lots of hit points. This classic 100% freezer currently costs a little above 3 million Neopoints, which is relatively expensive compared to many of the weapons on the list. However, it can be used with any pet species, which is very useful for pets wanting to use species-locked healers. Another very affordable weapon that currently costs less than 150k on the Trading Post. The Kacheek Life Potion heals 33% of a pet’s hit points when the pet has less than 33% of their maximum hit points, and heals 66% when the pet has more than 33%. This is a little confusing, but essentially this weapon is a percentage-based healer that can be strategically timed to heal more than some other healers. The only drawback of this weapon is that it requires a Kacheek, which is a harder pet to obtain because Kacheek Morphing Potions are relatively expensive. Lab rats who are constantly changing species will find it expensive to constantly morph back into a Kacheek. These are both very similar weapons that heal 50% of a pet’s maximum hit points. They function only for Gelerts and Elephantes, respectively. They are certainly more consistent than the Kacheek Life Potion and are similarly affordable, costing a little over 100k on the Trading Post. The Gelert Healing Remedy is a little harder to use for lab rats because Gelert Morphing Potions are more expensive than the very cheap Gold Elephante Morphing Potion. If users want an affordable freezer and healer in one package, they can look to morphing their pet into a Lenny. The Bag of Lenny Healing Seeds currently costs around 1 million on the Trading Post, which is expensive, but could mean big savings as Lennies can use the Entangling Lenny Lasso and the Bag at the same time. The Bag of Lenny Healing Seeds also heals 50% of a pet’s maximum hit points. Not really a shield- it deals five earth icons. However, this weapon blocks all physical, which is very useful against many one-player opponents who use heavy physical icon weapons. This is also more of a luxury because shields are just not as useful in one-player battling. The good thing about this weapon is that it is extremely affordable, being currently buyable on the Shop Wizard. Also a very cheap weapon, this defensive staple blocks five earth icons, five water icons, and three physical icons. It is also a luxury weapon but could be useful against certain opponents using these icon types. Obtainable at level 50 and requiring 15 light faerie blessing, Lens Flare allows players to dominate in one-player battling. It prevents opponents from using weapons for one turn. It can be combined with a freezer to essentially take an opponent our for two turns, allowing much tougher opponents to be defeated. This ability is obtainable at level 25 and allows the user to inflict six water icons of damage. It is very simple and straightforward- it just adds damage. An Icicle is still the best constant damage-dealing faerie ability for any pet at any level so this ability is very useful for intermediate battlers. These are the weapons and abilities that can help intermediate battlers take down the toughest one-player opponents. Good luck to all aspiring battlers!